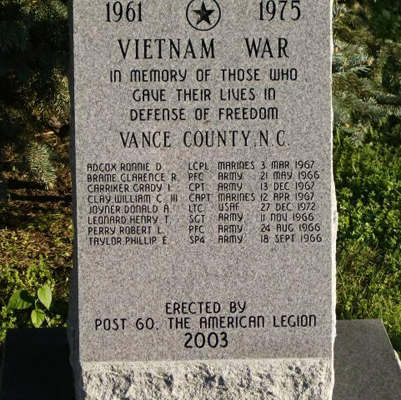 Description: The memorial is a small granite slab that lists the names of the men from Vance County who died in the Vietnam War. The inscription includes their names, branch of the military that they served, and the dates of death. It stands in line with two other monuments - the Vance County WWII and Vance County Korean War memorials. Sponsor: This monument was erected by Post 60 of the American Legion. Location: The monument is located across from the First United Methodist Church on Garnett Street. It stands in line with two other monuments - the Vance County WWII and Vance County Korean War memorials. The Vance County Confederate Monument stands down an adjacent street, in front of the Courthouse.